Liposuction, also known as Liposculpture, is a fat extraction procedure used to remove unwanted fat deposits. The procedure was introduced in the United States in 1982 and is now the most commonly performed plastic surgery procedure. The procedure eliminates bulges of fat from different areas of the body with minimal scarring. Changes in your body contour following the liposuction procedure can be quite dramatic. Clothing will fit differently and you will look slimmer. When performed by a well trained Board Certified Plastic Surgeon, the liposuction procedure is usually well tolerated and very safe. Liposuction is often performed in conjunction with other procedures such as the Tummy Tuck, or breast procedures. How do I get rid of these saddle bags? What problems does a Liposuction address? Patients are a candidate for liposuction if they have pockets of fats that do not respond to exercise or diet. These fat pockets are usually areas of 'slow burning' fat. The body has certain places where it prefers to store 'slow burning' fat. This varies from individual to individual. These bulges of slow burning fat give the figure its particular shape, whether it be an 'hourglass' or a 'pear' figure. Unfortunately, if you don't like where these bulges exist, they can be hard to get rid of since they are 'slow burning' fat. Even with diet and exercise, you will probably lose weight in other areas before you lose those bulges. Liposuction targets these areas specifically and can remove the fat deposits. In summary, Liposuction removes fat deposits, but it is not a weight reduction technique. Liposuction can not help poor muscle tone or skin tone. In fact, if your skin has poor elasticity, having liposuction will make things look worse! Likewise, a person with hanging skin is probably a better candidate for dermatolipectomy or tummy tuck. More than any other cosmetic surgery procedure, there are many different ways to perform liposuction. Not only does the technique vary among surgeons, but the instruments and equipment used to perform the procedure are completely different. In addition, each technique has it's own risks and benefits. The most common techniques of liposuction are Tumescent Liposuction and Laser Liposuction. The 'name' of each technique references different features of the procedure. In the case of the two common techniques, 'tumescent' refers to the anesthetic injected to numb the area before the fat is taken out, and 'laser' refers to the fat extraction method used. Generally speaking, the various liposuction techniques are defined by three components: type of anesthetic to numb surgical area, suction method to extract or destroy the fat, and cannula size for fat extraction. Below is a more complete description of each of these components of the Liposuction procedure. My preferences are listed in bold. After performing Liposuction for over 25 years, my preference is the Tumescent technique with manual or power assisted suction, performed with thin cannulas. This technique is also referred to as the Coleman Technique, developed several decades ago by Sydney Coleman, MD, a New York Plastic Surgeon.In comparison to other techniques, it's not even close! The tumescent technique with thin cannulas is my exclusive choice of technique for the liposuction procedure as it provides the best results with the best safety profile. All of my liposuction procedures are performed in my AAAASF Accredited and Medicare Certified Surgery Center located in Baltimore, Maryland. I serve as Medical Director for the Facility and we employ only Board Certified Anesthesiologists who are highly skilled with IV sedation techniques. What type of anesthesia is used for my sedation? This refers to the anesthesia administered to you to put you to sleep or relax you. This is different from the anesthesic used for the infiltrate solution. There are generally three choices: Local, IV sedation, and General Anesthesia. Liposuction can be done under local anesthesia for small areas. One example of the use of local would be for liposuction to isolated areas of the face. For more extensive areas, I use IV anesthesia instead of General Anesthesia. This reduces the risk of pulmonary embolism which is the main risk involved in the use of General Anesthesia. With IV anesthesia patients wake up and recover much faster. Read more in my blog about types of anesthesia used in cosmetic surgery. After the anesthesiologist has administered IV sedation to put you to sleep, the area where the fat is being removed will first be injected with tumescent solution. This solution contains very small, controlled quantities of epinephrine and lidocaine. This tumescent solution will numb the area, but it also provides an important safety function in that it reduces bleeding while the fat is being removed. The smaller blood loss volume means that the procedure is safer and less risky. In addition, with the tumescent technique larger quantities of fat can be extracted safely compared to other techniques. Once the area is numbed with the tumescent solution, I insert thin 3mm cannulas through tiny incisions to remove the fat. These tiny incisions are only 1/4"-1/2" long and they are placed very strategically into hidden areas such as the buttock fold. In nearly all patients, these tiny incisions close completely and do not leave any type of mark or scar. To remove the fat I use both manual and suction assisted techniques. Once the cannula is placed through the tiny incisions, the cannula is moved in a controlled back and forth motion to dislodge the fat. The excess fat is then sucked through the cannulas using a surgical vacuum or a syringe which is attached to the cannula. With both types of extraction instruments, I use very precise extraction pressures. Fat is collected in 1 liter medical containers. Each liter holds 1000cc of fat. How much fat can be removed in one operative session? During my surgical career, I have safely removed up to 10 liters (10,000 cc) of fat. This is an unusually large amount, but I mention it to illustrate the historical safety of large volume fat removal with the tumescent procedure. In my practice now, I routinely remove 4-5 liters (4000 cc-5000 cc) of fat for most procedures. Extraction of these fat volumes and higher quantities can be done safely using the tumescent technique. These higher amounts can be safely extracted because the tumescent solution prevents blood loss during the surgery. With tumescent technique the blood loss is kept to an absolute minimum, allowing for a large amount of fat extraction. Other techniques can not remove high fat quantities safely because without the tumescent solution, too much blood is mixed in with the fat. Therefore, other techniques are more limited to the amount of fat that can be extracted safely. However, during 2014, the AAAASF (international organization which accredits out patient surgery centers) recently imposed a limit on the amount of fat that can be extracted at any accredited surgery center in one surgical session. Regardless of the technique that is used, the maximum limit of fat extraction is now 5000 cc, or 5 liters, of fat. Therefore, if the surgery center is accredited by the AAAASF, the maximum amount of fat that can be removed in one operative session is 5000 cc, unless the Facility provides a 23 hour overnight stay. Fortunately, the 5000 cc fat extraction amount is a reasonable limit, and only seldom will someone need a second operative session to remove more fat. 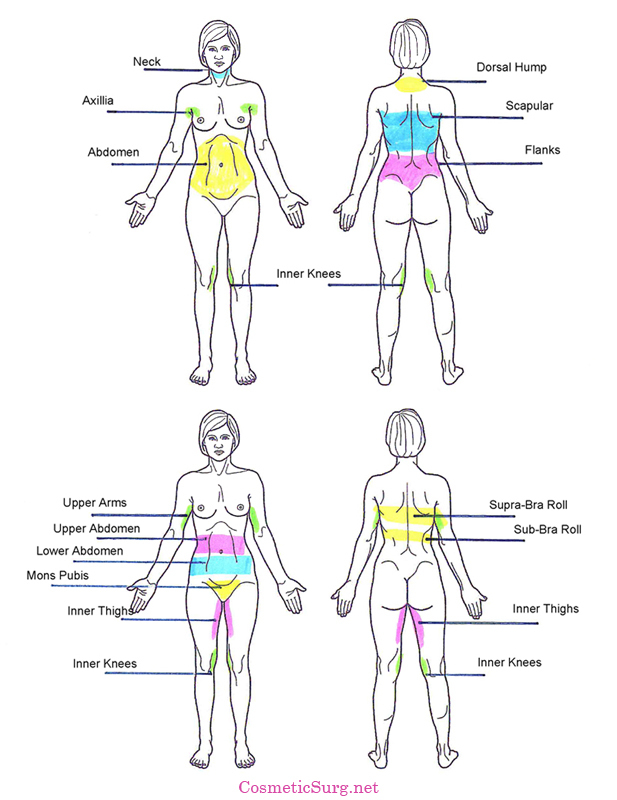 How much fat is typically taken from each area liposuctioned? If you ask a surgeon how much fat he removed, he will normally reply back with the volume, or # of cc of fat removed. However, most patients want to know what this fat tissue weighs on the scale. What is the importance of thin cannulas? Thin 3 mm cannulas allow your surgeon to fine tune the contour of your body. It's the difference between using a fine paint brush vs a large paint brush to paint letters on a sign. You can get more detailed and fine tuned results with a slimmer instrument. The only downside of your surgeon using a thin cannula is that the fat extraction will take longer than removal of the same quantity with a fat cannula. However, getting a much smoother result is well worth the extra cost for a little extra operating room time! To read more about why I think small cannula tumescent liposuction is better than ultrasonic or laser liposuction watch the video, Tumescent lipo vs. laser lipo-Which is the best?. What is Liposuction Post-Op recovery like? Prior to transferring you from the operating room to the recovery room, we will place you in a compression garment, which was custom ordered for you prior to surgery. I will also insert Topifoam pads inside the garment to ensure the most even healing possible. Since your procedure is performed with IV anesthesia instead of General anesthesia, most patients are discharged from the recovery room within one hour of the surgery. For the next 24 hours, it is likely that you will have some fluid discharge from the tiny incisions that were made to excise the fat. The fluid that leaks is light pink in color as it is diluted blood and tumescent solution. This is completely normal and you should not be alarmed. You will be sore for the first few days following your liposuction surgery and will have some bruising. You will be given prescription pain medication to alleviate discomfort during the first week of your recovery. Day 1-5: Rest at home , drink plenty fluids, and do not remove the compression garment! No showers! Day 5: Office visit follow up to remove the garment and topifoam pads. You can now remove your garment daily to take a shower. If you have good muscle tone and good skin elasticity but find you are frustrated with pockets of fat in areas that don't go away with a healthy diet and exercise, you might want to consider liposuction. The best way to know if you are a liposuction candidate is to schedule a consultation. Give us a call at +1-410-494-8100 or Contact Us online for a complimentary in-office consultation or a $75 virtual consultation. Total costs include the surgeon's fee, operating room fee, anesthesia fee and post-operative garments. See before and after Liposuction photos of cases performed by Dr. Ricardo Rodriguez, Board Certified Plastic Surgeon with over 20 years experience. Please note that all of the patients featured in our gallery have given written consent for us to use their photos at our web site. We are very grateful for their participation in patient education!